On May 4, 33 seventh grade students from the Eliot School clipped on pedometers and set off for a two-mile walk down the Rose Kennedy Greenway in the heart of Boston to launch the school’s Walking Club. 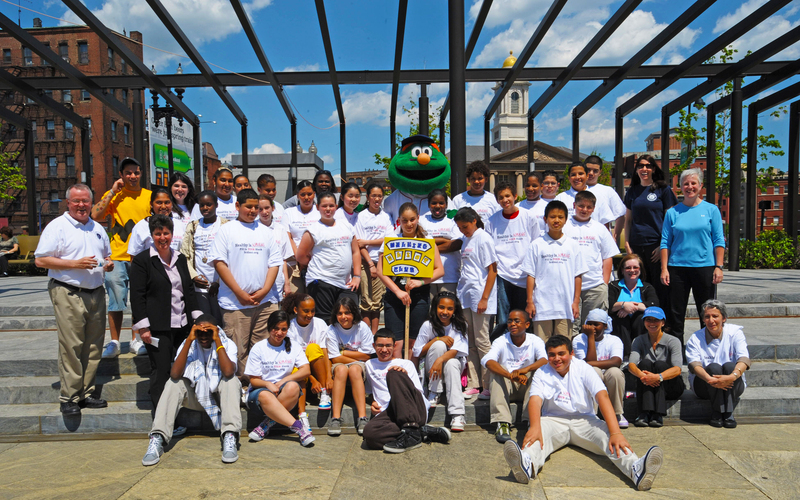 Eliot School seventh graders hang out with Wally the Green Monster before setting off on their Greenway walk. Developed by clinicians at Beth Israel Deaconess Medical Center for students and their families, the Walking Club was a pilot program at the Eliot implemented by Amelia Tonkin, the school’s City Connects-New Balance Foundation health and wellness coordinator. Tucked into Boston’s cozy North End neighborhood, the Eliot doesn’t have a gym, so Amelia embraced the opportunity to motivate her students to exercise outside of school. BIDMC provided a pedometer for each student, as well as one for a family member, to help walkers keep tally their steps; the launch yesterday racked up 4,500 steps alone! The students were joined by State Senator Anthony Petruccelli, who represents the North End and applauded the Walking Club’s focus on exercise as a way to prevent future medical conditions like obesity and high blood pressure. Wally the Green Monster, team mascot of the Boston Red Sox, also cheered on the walkers. The Walking Club kit teaches students about the many physical and mental proven health benefits of walking. It includes vocabulary words, a walking quiz, a chart of key muscles used when walking, and a diary to record their exercise. It also explains how to calculate heart rates and evaluate the level of intensity of the exercise. Watch WCVB Channel 5’s coverage of the walk here.